Artist’s impression of a Dyson Sphere. (Image: Slawek Wojtowicz). Remember all that fuss last year about the supposed discovery of an alien megastructure? A new study is taking issue with some of the data used in support of the theory, claiming that the observations were tarnished by the inconsistent use of telescopes down here on Earth. As you may remember, star KIC 8462852, also known as “Tabby’s Star,” attracted considerable because of its unprecedented flickering behavior. Normally, dips in brightness are taken as a sign that a planet is passing in front, but Tabby’s star is quite different. It features fluctuations consisting of dozens of uneven, unnatural looking dips that were measured over the course of a four-year period. 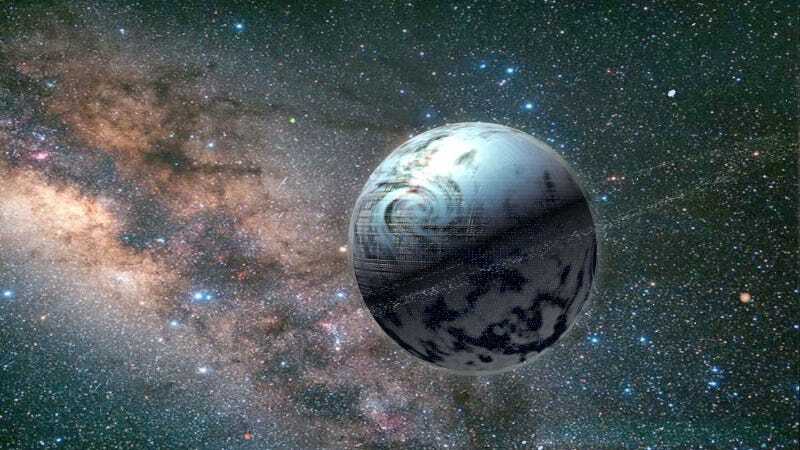 These strange observations prompted Jason Wright of Penn State University to suggest that the star’s weird distortions might be the result of a massive alien megastructure, such as a Dyson Sphere. Things got even weirder a few months later, when researchers from Louisiana State University claimed that the brightness of Tabby’s Star had dimmed by a whopping 20 percent over the last century—something that’s “completely unprecedented for any F-type main sequence star.” This new observation was difficult to explain by natural means, but it certainly gave credence to the megastructure idea. Now, as reported in a new Astrophysical Journal study, there’s something seriously wrong with the LSU study. A team of astronomers from Vanderbilt University and Lehigh University, along with the help of an amateur astronomer and a NASA postdoctoral Fellow, decided to scrutinize the data used in the LSU study. They’ve concluded that there’s no credible evidence to support the idea that this star dimmed to such a dramatic extent over the past century. The reason for their investigation had to do with the source of the data: Digital Access to a Sky @ Harvard, or DASCH. Using this innovative telescopic technique, Harvard astronomers were able to collect more than 500,000 photographic glass plates between 1885 and 1993. Trouble is, several different telescopes and cameras were used to collect this data over the course of the 108-year-long project. D’oh! Well, this is how science works. On the bright side we can now throw the LSU study out of the window. But the mystery of Tabby’s Star is far from over. Observations taken by the Kepler Space Telescope from 2009 to 2013 still needs to be examined further. There’s something weird going on around Tabby’s Star, and we still need an explanation. To date, some of the most credible theories include a swarm of cometary fragments, or an effect created by a distorted star. But until this mystery is finally solved, it’s a safe bet that people will continue to point their wishful thinking fingers at aliens.